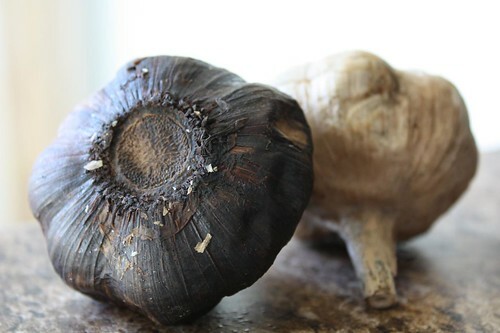 Black garlic is something I've been trying to get my hands on for a few months now. Sure you can order black garlic online but that's only if you want to pay $3.99 (plus $7.49 shipping) to receive two bulbs. Listen, folks, I'm not made out of money! Of course you could donate money to me. That way I'd be able to afford such luxuries! That said, I am more of a thrifty chef. A "frugal gourmet" if you will. I heard rumors of a shop in town that sometimes had black garlic. When I asked the man who was toiling amongst the shallots, white garlic, and onions he knew nothing of this. He asked someone else who told me of a man. This man could be found at the other end of the store, far past the green onions, prepared sandwiches, and salmon fillets. It was said, in legend, that he would be the man to ask about this ancient relic. He reached under the counter and took out a ratty old paper bag from which he removed two bulbs of garlic, one slightly moldy. "One dollar," he said. Just one dollar! I took two. Mostly because I needed to throw away the moldy one. I had some remaining Malfadine noodles from Severino as well as some dried porcini mushrooms which have held a mailing address in our cupboard for some time now. I'm not even quite sure why I purchased them in the first place. Typically I will crush these up with a mortar and pestle to make a flavorful crust for veal or pork. Instead, to keep with this recent vegan-cooking phase I'm going through, I coated some cubed tofu which I'd pressed for ten hours in the fridge under the crushing weight of some sesame seeds and a quart of vegetable stock. I fried up the cubed tofu in a little olive oil/sunflower oil mix. I carmelized some whole shallots with a little olive oil and black garlic then tossed in some whole shiitake caps with some fresh time and white wine. After simmering for a bit I added almond milk, reduced down, then tossed in some cubed sweet potato (which I'd previously par-cooked), some of the remaining porcini dust, and the cooked malfadine. I even put one more ingredient that's secret that I need to keep secret until Jen eats it first because she'll be super skeptical. To see what the ingredient is click and drag your mouse down over the white space below. Nutritional yeast! Jen is very leery of this ingredient. It's a little bizarre but it can lend a certain type of cheesiness to a dish. That is when it's not just reminding you of fish food. 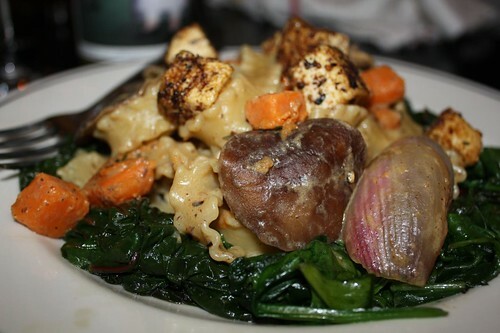 I laid down a bed of sauteed garlic and Swiss chard mixed with baby spinach, topped with the pasta mixture, then topped the pasta with bits of the fried porcini-crusted tofu. 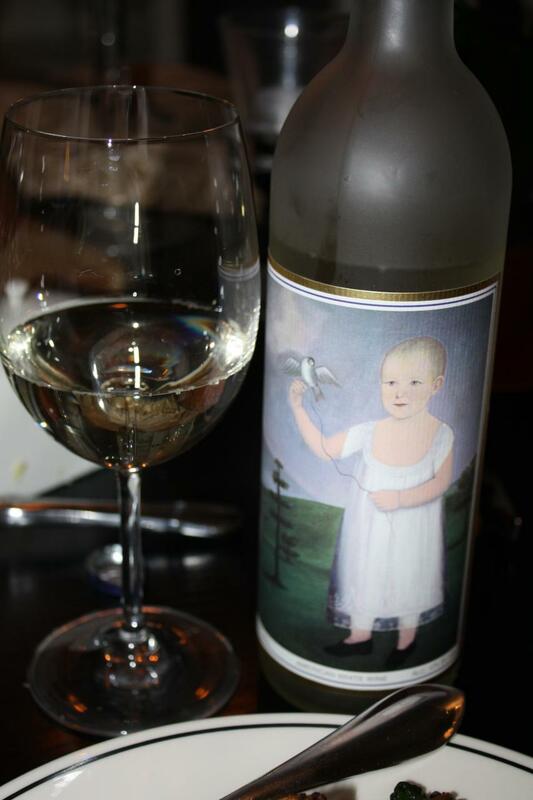 To accompany the dinner, some white wine from Sharpe Hill Vinegard in Pomfret, CT. Connecticut makes wine! Who knew? The result was interesting. I think Jen might have actually liked it more than I did despite the fact that she immediately identified the nutritional yeast! I think I might have flown a little close to the vegan sun with this one. I think my wax wings are starting to melt. I am skeptical about whether your "black garlic" was the real deal or not...maybe it's the old man who pulled it out of a mysterious bag haha. Or the mold you described growing on one of them. I'm guessing you did not enjoy it? 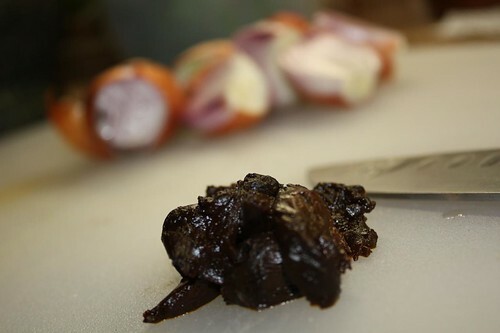 I personally am a fan of black garlic. I'm curious to see if you would have a different experience with the store-bought stuff. I hope you write about it if you do! Thanks for writing, Lydia! This is my first experience with black garlic. It was a great experience but I can't say I noticed a huge difference between black garlic and regular roasted garlic.